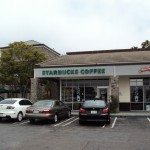 One more Orange County Starbucks store review. Since I was just recently in Orange County, I might as well post a little bit of my Starbucks adventures. 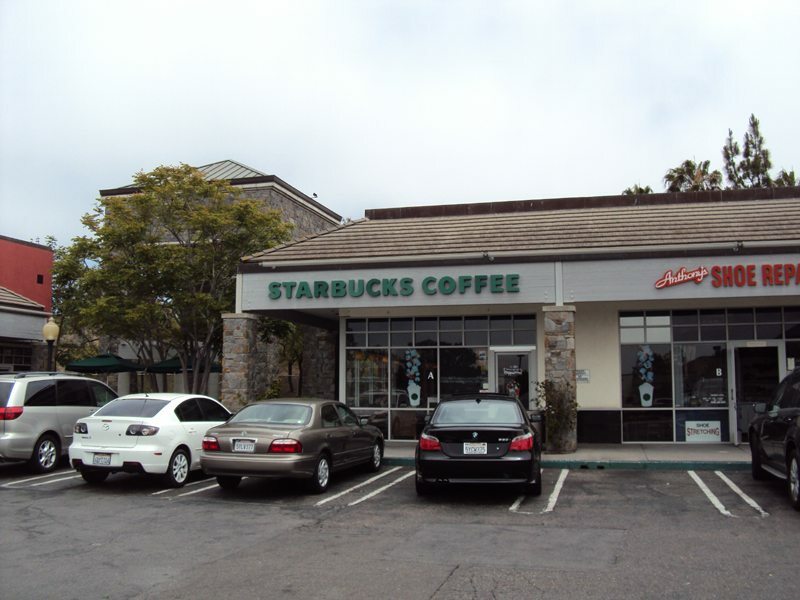 On June 7, 2010, I made it into a Starbucks located on Golden Lantern in Dana Point, California. This is a beach city in the southernmost part of Southern California, and home to the famous Doheny Beach. I arrived at 1:15 in the afternoon, and ordered a tall whole milk chai latte with vanilla. I got it in a for-here cup, and the black apron barista at the register pre-warmed the cup with hot water. That’s an important touch, and gets many extra bonus points for that. Jackie (the black apron barista) came out and started wiping down the tables while I sat enjoying my chai, and I asked her randomly what her favorite coffee is, and she told me Sanani. Okay, now I like this person. The store was clean. Trash can liners were changed while I sat. The bathroom was clean and stocked, and had a baby changing table too. There was a quiet stream of customers coming and going. One man came in and asked for grounds for his garden, and the store gave him a half-full bag of grounds. He walked away happy, from what it appeared. After my chai, I decided to get a cup of Sumatra and Jackie offered to brew it for by any brew method that I preferred. More points. 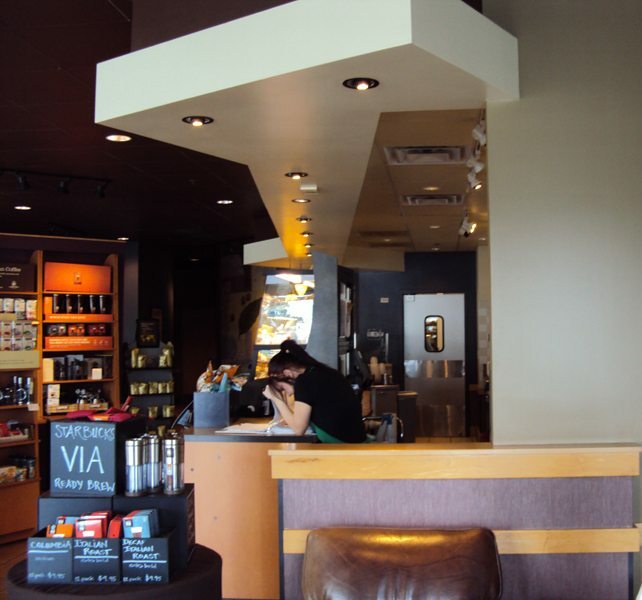 I sat down, people came and went, and meanwhile as I waited for the cup of coffee to be brewed I saw a red-head young green apron barista run over and check the condiment area, checking the thermoses with milk in them. I order drinks in for-here cups often and I notice that in Orange County this routinely earns you a ten-cent cup discount which is definitely not the case in Seattle. Though I didn’t blog about it, I had previously visited a Starbucks near the Orange Circle in Orange, and also received a cup discount for a for-here cup. I imagine that really encourages people to use for-here ware. This store gets an A+. If they’re like this every day, Starbucks should be proud. But what makes this store great is the partners. They’ve hired somebodies and not just warm bodies. Somebodies will say “I’m someone who will check the condiment counter” and “I’m someone who will gladly brew Sumatra for a customer.” A warm body doesn’t have that oomph and is more likely to just stand around. Thank you to John Moore for teaching me that great little saying (“Hire somebodies, never warm bodies.”). I don’t even know if I am applying it correctly, but it sure sounds good! Again a great Store Review, Melody. Really like that! This is also why I wanna visit as many stores as possible on the globe…every single store can be so different and remarkable, you never know. And that is correct, the partner’s are the ones who make a stores pleasant or not. Mostly they do…but unfortunately sometimes also not (I know some examples here in Germany). You can see if they do their job with love and respect towards the Starbucks-principles or not. Wow what a great post. I wish there was a SB like that around here. I like the baristas at the SB I frequent, but if I had to put them into the category of warm bodies vs. hires somebodies than I would have to admit they would belong in the first category. Not to say there are some that are truly promoting the SB goal,but not many. Where has SB gone wrong? Enjoyed the post! That store looks warm & inviting. And I agree about the ‘warm’ versus ‘some’bodies… The SB stores around here (Seattle) have baristas that are engaging, always enjoy my visits. 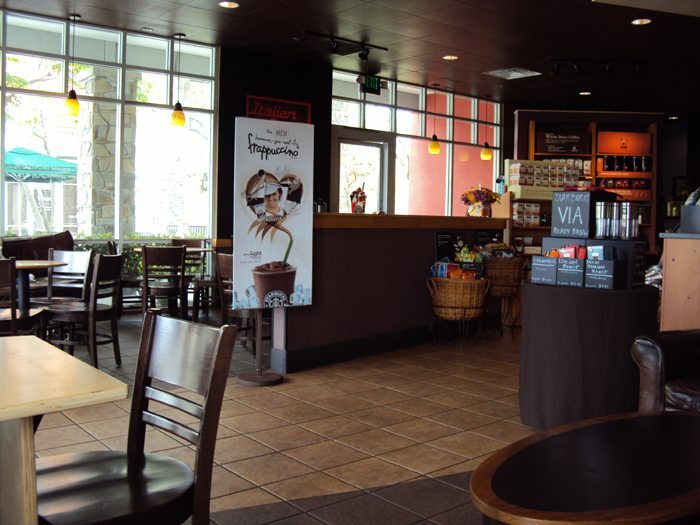 Reply to purple1 – That visit to this store really accentuated the difference between EXPERIENCE and brand new barista. I saw opposite extremes in that store visit. The black apron barista who likes Sanani was amazing. She’s the kind of experienced long-term partner that Starbucks needs to hang on to. They need to fiercely hang on to these partners! At the same time while I was there, I met a really young green apron barista. She didn’t appear to be over 18 to me. She said she’d only been with Starbucks for like a month or two. I don’t remember exactly how long she said. I asked her the same question (“What’s your favorite coffee?”) and she seemed to not understand what I mean. Her reply was “Iced White Mocha”. She didn’t understand what I meant. I further explained that I was talking about the coffees on the whole bean wall, and she just looked at me and explained that she didn’t really drink coffee. Now, I give her a break that at that young age, most people aren’t working on their palates in learning how to distinguish between an African coffee and a Latin American coffee. But seeing the young barista who likes Iced White Mochas side by side with the older black apron, I saw the two extremes of the barista spectrum. Over time, the green apron barista, if she sticks with it, might turn into an enthusiastic black apron. We all start somewhere (meaning all the partners, obviously I am not referring to me here since I’m not a barista). I had decided not to blog about the two extremes. The young girl who was brand new seemed to be enjoying her Starbucks experience (and I’m convinced there are many layers of experiences) and time will tell whether she grows into a coffee fan. What you can’t have is a store with all newbie green aprons. You have to have both kinds of partners. I never see a black apron barista at the SB I frequent most often. So, the question is twofold- Does she SB store require someone to achieve black apron status or is it hit or miss and second do they just forget to wear their black apron. And with the new barista do you think this is a summer job for her and she will return to school and further is there someone in the store willing to take the time to teach her about coffee and get her to level you speak of. I suppose the level of training speaks to how the energy is in the store. Like any company, the motivation at the top and team effort spills down to the bottom. If I were a manager, I wouldn’t hire a teenager to just work there during the summer. I would assume that person expressed an interest to stay for a good while. Turn over is really important, not just because it means when you lose someone, it costs the company money to hire and train someone new, but because it means the relationship between regulars and baristas can go on and bring steady business in. Does anyone have opinions about the window decorations Starbucks has been using lately? I’m not a fan, and was wondering if anyone else disliked them like me. I just think they look tacky, and detracts from the ambiance of the store. Maybe I’m the only one, though. The last barista I saw doing a coffee passport was over a year ago, and she had to come in on her own time to taste the coffees. I don’t think the managers are given the employee hours anymore to have new and/or interested employees learn the different tastes and food pairings. I even know a couple ASMs that won’t do it, because they don’t like coffee. @Karl That’s unacceptable!!! If I worked at a store where people didn’t have coffee passports completed I would blow up. Its super easy to get them done on the clock. Just prioritize!!!! And don’t be afraid to do it with customers!!! I agree that the window decorations are not great and certainly do not pull you into the store. Nor do I think the displays inside are much better. @CamSpi – I agree with you on the window stickers. I referred to them as “Taco Bell-like” in an earlier reply on this blog or SG. 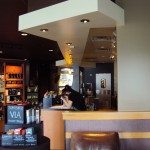 I do not think they belong in Starbucks – nor do the big banner signs they have inside the stores. I’ll make an earlier suggestion again – an interview with John Moore (and perhaps the guy from Idea Sandbox) would be interesting to see on this blog. Wow that sounds like a great Starbucks experience! (mmm chai) thanks for letting us hear about the nice store, and the pictures, I love seeing other Starbucks around the country. Perhaps the young barista hasn’t had a chance to sample enough coffees to find one(s) she likes. I started out just drinking mochas, everything else tasted too much like coffee. :p Now I’ve expanded into flavors besides chocolate in lattes, occasionally black coffee, and also brewed teas. It takes time to find one you like. If she grew up with parents who made crummy coffee, perhaps she just doesn’t know what good coffee tastes like yet – or even that there is a difference. When I worked for Starbucks, I had a hard time getting my coffee and tea passports finished. I was almost always scheduled during busy times, so we didn’t have a lot of downtime to sample. I did a lot of my tasting on the weekends with my husband – on my own time. It took me a while to find a brewed coffee I liked. And some of my first descriptions were that it tasted like coffee – it took time to taste the differences. @CD – Hi there! As always I love reading your comments. I might interview John Moore but I’m having a hard time thinking up questions for him – If you or anyone have questions for him, please tell me! @Merryncole – you’re absolutely right that the young barista who was new probably hasn’t even had time to try a bunch of the whole bean coffee offerings. Hopefully she will. I probably should have written about both of the baristas in the body of this post rather than the comments. I still think a store needs both kinds of baristas. Young new baristas also offering a store a chance to have partners who relate to young teen customers for their Starbucks experience. Since I’m convinced the “Starbucks Experience” can take on a variety of meanings, it means having a variety of baristas. Oh I’m rambling. Sorry. Thank you for the comment!! @CamSpi – I was looking at your reply about window directions, and re-looking at the pics in this thread. 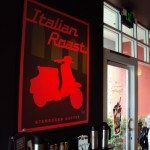 When I took the pic to capture the Italian Roast poster in it, I captured the Frappuccino door-window sticker nicely too, which hadn’t really been my intent. 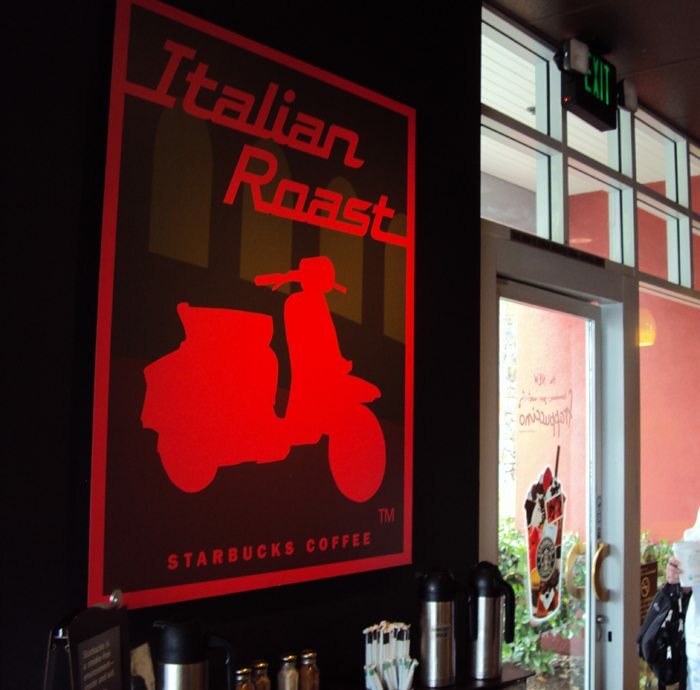 Starbucks used all kinds of window stickers in 2008 for the then-called “Starbucks Vivanno Nourishing Blend”, including having last minute axed “karate man” (there was a Karate Man blog post here at StarbucksMelody but I de-published it.) Yeah I’m not a fan of the window stickers really and it does remind me of Taco Bell. When I was in lawschool I remember that Taco Bell was promoting some burrito and had these window stickers that said “Get Stufft” – I can’t find any image of it (perhaps there are no Taco Bell brand evangelists lol) but it was the most annoying window sticker. A big burrito with intentional bad grammar. If Starbucks ever did something like that, I’d be totally mortified. Something to note about the new barista as well… I’ll compare to my own introduction to Starbucks. It probably took me tasting through two full coffee passports before I started to be able to smell and taste the differences between the coffees. I’d do my tastings with someone else and they’d say ‘this smells really citrusy’ and I’d write that down all the time thinking to myself ‘this smells like coffee and wow…it tastes like coffee too!’ But, once I started into my third passport the aromas and flavours started to be distinguishable to me. Back when I was a couple of months in I’d have told you my favourite drink at Starbucks was Calm Tea. I know you weren’t thinking badly of her Melody, but I thought I’d just share my experience which might provide some context. @Melody some younger baristas do become enthusiastic despite themselves not liking coffee. I’ve had a BLAST doing tastings with a younger employee who told me she didn’t “like coffee”. She wanted to learn and do her job well and takes SO many notes! She just decided she does like coffee :). But, I believe the type of passion already present in a cafe will greatly influence the passion in others. When I was hired my first tasting was with someone who loved coffee and loved their job. I was excited right away. Passion is contagious! @Campspi I agree about priorities. What is important to you will get done. Evidently I’m the first in a long time to do my passport on my own and want to get it done. But, anytime I would see a quiet time I’d make a press and pull out the passport. But, I’m a passionate person. i.e. if something interests me, I dive in head first lol I don’t do things half way.